The national touring theatrical troupe Act!vated Story Theatre will arrive to “Act!vate” multicultural folktales at the Bryam Shubert Library, 21 Mead Avenue in Greenwich, on Monday, Sept. 10 at 3:00 p.m . The 45-minute program is free and suitable for all ages. The troupe will perform the African tale “Hatseller and Monkey” (popularized by the book Caps for Sale ) and a legend about how the ice cream cone was invented at the 1904 World’s Fair in St. Louis. 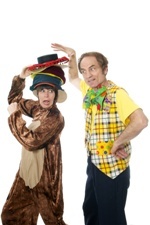 For more information, please call the library at 203.531-0426 or visit http://www.activatedstorytheatre.com. Kids are invited to learn parts to perform on stage as “guest stars”. To get a part in the show, kids age 6 and up must attend the free pre-show theatre workshop which begins half an hour before showtime. Participation is limited to 12 children, no experience necessary. The performance itself is open to everyone. Act!vated Story Theatre was founded in San Francisco in 1988 by Dennis and Kimberly Goza. The professional touring troupe has performed in 45 states plus Washington, DC and Japan.